I count household and toiletry items as part of my grocery budget, which means every time I have to buy laundry detergent, there is less money for me to spend on cheeeeeeese or other equally delicious things (what a lie - there is nothing as equally delicious as cheese). I think the truly cheapest way to get household items like toilet paper and shampoo is probably through drugstore deals. I subscribe to Common Sense with Money and they have weekly posts about the deals at Walgreens, CVS, and Rite Aid (not to mention Wal-Mart and Target). But 1) I don't take the newspaper and you usually really need those coupons in order to rack up your savings and 2) the idea of going to the drugstore on TOP of regular grocery shopping and then trying to keep track of my Register Rewards and CVS Extra Care Bucks without letting them expire overwhelms me. If you are willing to put in the effort there, though, you really can save a ton of money. For me, the happy medium is Soap.com. I was wary until I made my first order a few weeks ago when Bart needed new razors and the idea of making a special trip to Sam's Club made me want to weep softly into the carpet. But buying razors at the grocery store makes my soul shrivel up and die a little because I might as well just flush dollar bills away. And for many household items, I'm not usually willing to go with a generic version because they simply don't work as well (the difference between Tide and the $2 bottle of detergent? night and day for me. And my husband hates any deodorant that is not Old Spice). Everything on Soap.com is pretty reasonably priced (the Mach 3 razors, for instance, were cheaper per blade than if I'd bought them at Sam's Club), and they often have digital coupons that you just click and they'll take off anywhere up to $3 off. Brilliant. Shipping is free if you spend over $39 (which thrills my husband because it means I will actually stock up a bit on things he lives in fear of running out of). And if you aren't happy with something, you can send it back for free too. AND, if you have coupons for items, they send you some postage-paid envelopes with your order that you can stick your coupons in and mail back to them and they'll post them to your account (you have to send them in at least a week before they expire) and you can apply them to your next order. I love it. There are almost always coupon codes so that you can $10 off or 20% off your entire order, etc. 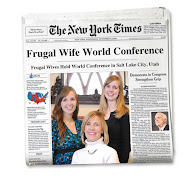 If you use the code FRUGALWIFE when you check out, you can get 20% off your first order. AND (I know, it just keeps going), if you go through Ebates first, you can get up to 5% back in cash. I tell you, when that box of deodorant, razors, lotion, and Draino (yes, envy my glamorous life) just showed up on my doorstep, without me having to leave the house or drag my baby out with me, it was pretty much the greatest thing ever. That UPS man probably thinks I have a very sad existence. Seriously, I am completely sold (just ask my mom, who had to listen to me talk on and on about this on the phone the day after my box arrived). This post is so right on time for me right now. I'm so tired of having to go to Costco and the grocery store on a busy weekend. Drives me nuts! I need to give this site a try. And if it saves me on sanity and money it's a win, win! You may have just completely changed the way I shop! One thing you didn't mention is how expensive gas is right now. Where I'm at it's about 4.00 a gallon. Yes, I can drive to a million drugstores to get great deals but that is only using up my precious gas budget. So this website would not only help save my grocery budget but my gas budget as well. Woo hoo! After checking out soap.com, I looked and they are on ebates.com so you can get an additional 1.0-5.5% back! That's a double win if you ask me! Wow! I am really excited about this. Diapers on Amazon (thanks to you) soap, paper & cleaning products on soap.com... now we just have to pray someone comes up with an efficient way to do grocery shopping online and then I may never have to tow all my kids to the store ever again! By the way - just made my first order but apparently this address had already been registered for an account. I called them up 2 rings and straight to a real live person (does that ever happen anymore?)! 2 minutes later my 20% off was taken off. Just thought I'd put a word in for their excellent customer service. I knew stuff like this was out there, but haven't dared (taken the time) to venture much beyond amazon. Thank you! cheese really is the best! I will love you for ever for telling me about this. Also, we are cheese soul mates. I don't know if it's still going on, but the last two times I ordered stuff on diapers.com, I earned 30% cash back to be spent at diapers.com or soap.com. Two boxes of diapers alter and I had 20 bucks of free stuff to buy at soap.com. It was like Christmas! Agreed! I love soap.com, as well as diapers.com! Just put in an order. Found my facial cleanser that Walmart and Costco apparently aren't carrying anymore, so that was a huge bonus. Thanks! "making a special trip to Sam's Club made me want to weep softly into the carpet." hahahaha Janssen I love you. I totally feel the EXACT same way. So much so that I usually just end up buying toiletries with my groceries and then I'm grumpy for days because I've spent my entire budget on dish soap and mascara. But we got an ad in the mail the other day from soap.com and I was totally impressed, but I kept putting it off and wondered if it was worth it. But I'm sold now, THANK YOU!!!! ps. Way to get a coupon code, that is amazing. I'll have to look into this. It looks like there is a cash back for soap.com on ebates too, so may as well! Do you use slick deals? Dan has gotten us some great deals on that, including cereal, by signing up for automatic notifications on items we're looking for. We have been able to get name brand cereal quite often for the same price or less as the Aldi brand cereal, including the shipping to our house. Not to mention our blue tooth headsets we got for $.05, etc. Anyway, thanks for the info! I agree that some of the cheaper brands just don't work, or one has to use 3 times as much. No savings there. Another way to save money is to read the directions carefully. For example, in the last box of laundry detergent I purchased, a large plastic cup was included, but the package advised that the detergent was now more concentrated. So, when I read the directions, I really only needed to use a little less than a TBSP instead of the filling the cup. pakistaniand indian lyrics songs on this website. Pretty! That was a really wonderful post. Buy Adderall Online Without Prescription. Adderall is psychostimulant medicine with a combination of Dextroamphetamine Amphetamine salts. Adderall is used to treat Attention Deficits Hyperactivity Disorders.